Rodolfo was living life in an institution in June of 2010. 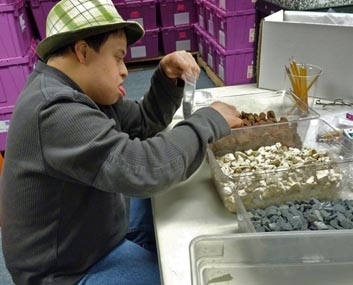 That summer, with the assistance of a federal/state grant called “Roads to Community Living”, he was able to transition into a residential facility in the community as well as to begin his journey toward employment by starting services at Work Opportunities Mountlake Terrace Center. An employment plan was developed with Rodolfo, including a target date to implement his time at the work center along with opportunities to connect to the community employment sites as well. In March, 2011, after touring a variety of employment sites, shadowing employees, and sampling a variety of work tasks, Rodolfo expressed an interest in volunteering at Hawthorne Elementary School. Rodolfo has been successfully volunteering in the science department at the school since that time. His primary responsibility is to package the science kits for the students. He has proven to be a hard worker and is thriving with his new responsibilities. Thanks to the Roads to Community Living Grant, his support network and the experiences he gained through Work Opportunities, Rodolfo will soon be celebrating his two year anniversary of exiting the institution and contributing to his community through volunteering.